October is the month of Libra. One of the two months of the year when the emphasis, astrologically, is on relationships. Libra is other centered, and classically much happier in a relationship than not. Though Libra will “go to the ends of the earth” to make a relationship work, she is by no means a patsy. Though Libras seek harmony, they can be a formidable opponent when necessary. Libra is a good opposite of Aries, though the “me first” side often needs to find balance. Libra is a Cardinal, or leadership sign, so likes to be in charge. Libra has been called the “iron hand in a velvet glove,” because the aggression side is not usually obvious. Libra is also an air sign, so possesses the intellectual acumen and communication skills of the air element, and is ruled by Venus, planet of charm and beauty. However, always looking at both sides and not liking discord, they can be indecisive, as well as argumentative, in order to show both sides. Libra is also, Astrologically, the foremost authority in aesthetics. And though not necessarily artists, being Venus ruled, they are the appreciators of classic art and beauty. Libras are usually idealistic, easy-going, diplomatic, romantic, and have a very refined appearance. However, they can also be gullible, frivolous and flirtatious. As I’ve always said, as with every sign, we won’t have all the characteristics of our Sun sign, because we possess them all in varying degrees. Libra time starts at the Autumnal Equinox, when the Sun enters the constellation of Libra on September 22nd, the day after the International Day of Peace. On the 21st, the Libra Moon also squares transforming Pluto in Capricorn. Major changes may not complete that day, however, whatever issues are going on in our relationships and closest connections, may come up. The evening of the 27th begins the four days of the First Quarter phase, when the Moon moves into Capricorn. This phase is often the time when changes occur, and coincides with a Jupiter in Libra opposite Uranus in Aries (27 degrees), the major aspect of September. We may feel a strong urge to be free of restrictions and obligations that we feel have limited our lives unnecessarily. If there are no relationship issues we should look at what patterns in ourselves are limiting our lives. We must be careful, however, not to “throw out the baby with the bath water” as they say. And if it is yourself that is the limiting factor, and someone else wants the changes, it is wise to give them all the freedom they need, as denial will only drive them away. This is a valuable transit, though disruptive. As for myself, there were changes and heartbreaks that took me years to get over. But in looking back now, I am in a much better place, and realize that what I thought I wanted, or wanted to hang on to, was not in my best interest. 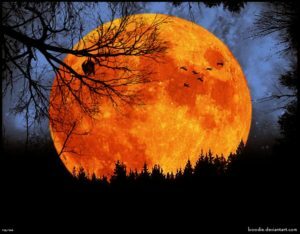 The Harvest Full Moon in Aries (13 degrees), the peak of the Libra cycle, is October 5th. Even though Venus & Mars meet in Virgo that day, enjoy the connection, but it may not be the best day to make important decisions, as Mercury, planet of communication is closer to the Sun in Libra, and opposed by the Moon in impulsive Aries in the morning (11 degrees). In the evening, the Moon squares Pluto in Capricorn (17 degrees), putting up some road blocks to cooperation. The weekend of the 7th and 8th bring much better communication and clear thinking. The Moon moves into earthy and grounded Taurus, and makes an opportunity sextile to compassionate Neptune in visionary Pisces (12 degrees), and a harmonious trine to Pluto in Capricorn (17 degrees) for more diplomacy and cooperation. Patience is also encouraged on Sunday, when Venus in sometimes too literal Virgo squares future planning Saturn in action-oriented Sagittarius (23 degrees). Stay open, as the Sun is crossed by Mercury, planet of communication, both in balanced and harmony seeking Libra. Jupiter is the first planet this month to change signs. On the 10th this planet of abundance and prosperity moves into Scorpio, one of the two main signs dealing with money and resources. This next year Jupiter brings its benefic energy through partners, clients, and families. Venus moves into one of her home signs, Libra, on the 14th till November 7th, when the focus will be on relationships, social connections and interactions, and/or artistic activities. Mercury moves into Scorpio on the 17th. Communication may take on a more intense and passionate nature. This is also a great time for research and writing, though submissions for publications may be better after November 5th, when Mercury moves into Sagittarius, sign of publishing. Mars moves into Libra on the 22nd, as the Sun begins Scorpio time. Mars will be in Libra until December 9th. This will be a good time to focus energies on the Arts and cultural projects and activities. October 19th contains the major planetary aspects of the month. The Sun and Moon meet in Libra for the New Moon, just days before Scorpio time begins. Both the Sun and Moon oppose unpredictable Uranus in impulsive Aries (27 degrees). This is a day to stay grounded, pay extra attention to everything around you, and expect unexpected changes and surprises. Also keep your vibration in a positive place. Make your intention to look for things that make you happy, and to make the best of whatever surprises are instore. That evening the Moon moves into Scorpio and crosses benevolent Jupiter, bringing some rewards. Maintaining an attitude of gratitude always helps. If you’re up late, there are meteor showers around the 24th. And the last four days of October are the First Quarter phase, when changes and alterations often occur. Let a series of happy thoughts run through your mind. It will show on your face. I wish you all a good and productive October, with more joy than not.